They liked the idea so we proceeded to design the site with those elements included. 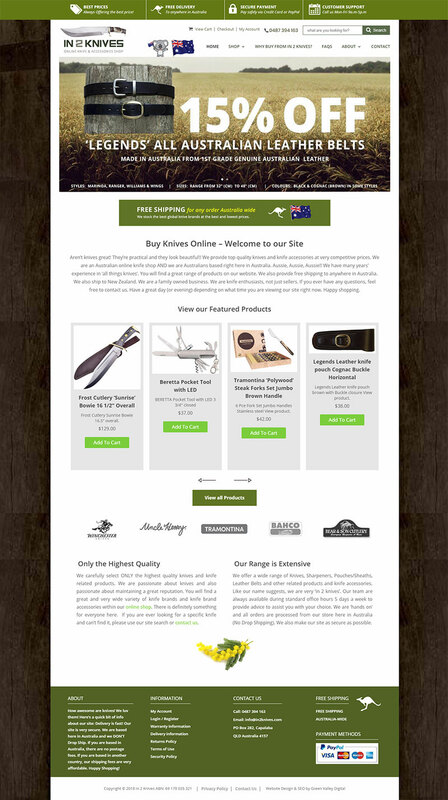 The home page I designed for the In 2 Knives online shop website. Click here to view the site. If/when we are commissioned to do Digital Marketing for this business, we will also add lots more features into the site, setup and run the Facebook page and other social media channels, make the website highly discover-able in Google, YouTube,… and many other things involving lead generation, funnels, Remarketing, Retargeting, Facebook Messenger, Facebook Marketplace and a LOT more. AfterPay would also be setup. We enjoy creating any type of website and online shop websites are no exception. This was a fun project and we got a buzz out of being able to add some ‘Australiana’ elements. As always, we thank our client for choosing us to create their site.